You may have noticed two separate types of pay amounts listed on your paycheck; gross pay and net pay. The gross amount is higher than the net amount, but you’re not quite sure why. 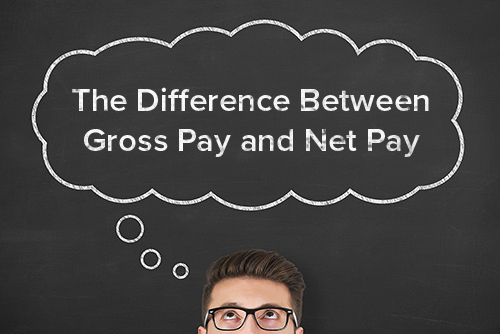 In this article you will learn the difference between gross pay and net pay, and why you should always check the accuracy of both on your pay stub to decrease payroll errors. Gross pay can be defined as a person’s total income before adjustments, withholding, deductions and other contributions are taken out. This is also your income in which your taxable amount is determined before it is actually taxed. For example, when you are hired and the compensation agreement between you and the employer is set for $50,000, your tax rate will be based on this amount. Of course this is not including additional income you may be receiving. Please note the list above does not include all gross income factors. Net pay is the remaining amount that is displayed on a paycheck after deductions, withholding and other contributions are applied. This amount is also known as your “take-home pay” and will be deposited into your bank account. Each person’s paycheck can vary depending on many factors such as location, marital status, and the number of exemptions an employee lists on their W-4, etc. Our example will be calculated from Paycheck City with a specific state of Ohio selected, along with a salaried employee without overtime who earns $50,000 per year, paid weekly, no city tax, claims 0, does not have any other deductions, and the filing status of married. It’s important to know how frequently you are being paid. See how to set up a pay period to work with pay dates. As you can see this particular employee would have a weekly gross pay of $961.54 and a net pay (take-home pay) of $781.43 per week. Federal withholding is $80.69, Social Security withholding is $59.62, Medicare withholding is $13.94, and the state of Ohio tax is $25.88. This employee does not have any deductions for retirement, donations, insurance, benefits, or any other voluntary contributions/deductions that could affect their net pay. Keep in mind this is only a basic example to make it easier for you to understand a breakdown of withholding (taxes), gross pay, and net pay. Gross pay = before taxes and deductions. Net pay = after taxes and deductions. If you have any questions then please drop us a comment below - we would love to hear from ya.